Businesses often wish to fund the education and further training of their staff members for obvious reasons. We are often asked about the legal aspect of bonding an Employee to the business in these cases. Unfortunately the answer is not as straight forward as we might like. Employers can of course get an Employee to sign a bonding agreement and feel quite protected by that, but it really comes down to whether that agreement will be enforceable if tested by the Courts, and it's always a case-by-case decision. Bonding Agreements generally bind the staff member to the business for a period of time until the parties agree the debt is paid, i.e. the Employer has recouped sufficient value from the Employee's new skills or qualification. If, as an Employer you are simply training a staff member for the job, that would been seen as only benefiting the Company rather than Employee. It would therefore be deemed unfair and thus unlawful to bond them. However, if the Employee gains a formal qualification or equivalent industry recognised skill which is clearly a benefit to themselves then the Business has a case to bond the staff member in order to gain value from the expense and investment they have incurred. It comes down to the parties agreeing on the terms and conditions in the bond agreement. This will vary on a number of variables with the particular course or training in question. The cost of the training, direct and indirect, length in time of the training, time off required, are weighed up against what is a reasonable length of time to bond the Employee to the Business in return. Generally it's accepted that bonding periods seldom exceed 2 years in duration. However longer periods do exist and can be agreed to by both parties. The trouble really begins when bonds get broken and the Employer seeks enforcement. If Courts deem the terms and conditions harsh and oppressive in relation to the training offered a bonding agreement isn't worth the paper it's written on. 1. 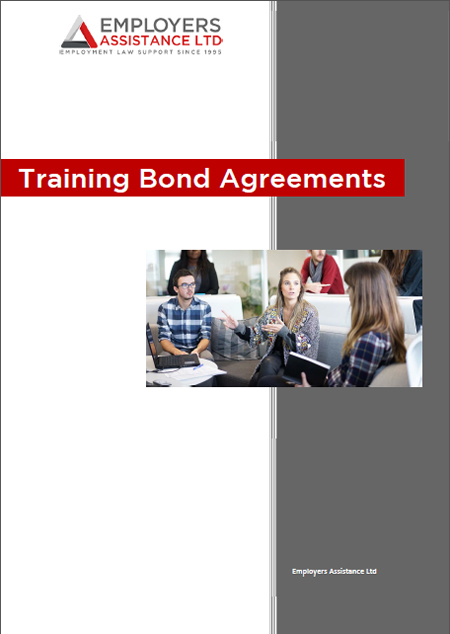 A standard bond agreement: A training course is funded by the Company, costs are a known value, the Employee is paid to attend and is bonded for either 12 or 18 months with a diminishing repayment value through time. 2. 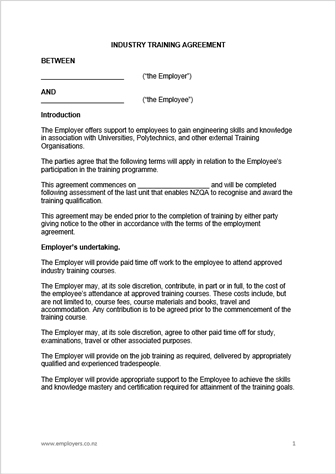 An industry training bond agreement: Generally for lengthier courses such as post-graduate studies, apprenticeships or industry qualifications where costs aren't always known upfront. With the option for the Company to fund it all or the Employee to self fund but paid time to undertake. "..peace of mind that expert advice is a phone call away at any point, the stress of employment issues arising is now under control.."